One incredible animal, which can sadly be found on the list of endangered species, is the magnificent snow leopard. This amazing creature is known and recognized around the world. It has two scientific names: panthera uncia, or uncia uncial, or the simple common name: snow leopard. This beautiful animal is very intriguing and has much to show us. The panthera uncia has a thick fur coat that is quite similar to the cheetahs. The pattern of the spots is almost exact, but the colors are almost opposites. The snow leopard has white fur with yellowish and smoky gray spots. The snow leopard weighs anywhere from 77-121 pounds. It reaches 24 inches in height at the shoulder and it measures 3-4 feet long. It also has a tail that can reach up to 3 feet which is used for balance. Even though it is such a sturdy animal, its life span is not very long. In the wild the longest a snow leopard has lived is 13 years. But in captivity, due to all the protection and medication, a snow leopard has been seen to reach 22 years of age. The snow leopard can be found nearly anywhere on this planet, but it prefers the rugged mountains of central Asia. They can live in the Himalayas, or in the high mountain ranges of Afghanistan, Mongolia, and Russia. Even though they are scattered all over, 60% of all snow leopards live in China. They like to spend their days on the broken terrain of cliffs, rocky areas, and ravines. They live in altitudes of 3.35 miles above sea level. Here the climate is mainly dry and cold with average temperatures being sixty-four degrees below zero during the winter and one hundred degrees in the summer. Because of its habitat, the snow leopard has had to adapt in many different forms. The snow leopard’s coat is a super important adaptation, for without it, it would freeze to death during the cold seasons. Because of the tough terrain and rocky areas, the snow leopard needs extra gripping and that is exactly what gets from its extra padded paws. This amazing animal also has a specialized chest to be able to get more oxygen from the thin air. Another adaptation the snow leopard has is the bigger nasal cavity allowing it to warm the air before it reaches its lungs. The snow leopards’ habitat also has a big influence on its diet. Because only sheep, goats, horses, small yaks, and hares live in the same habitat, they are what the snow leopard mainly hunts. They hunt every eight or ten days depending on the size of the prey. Even though the snow leopard is small in size, it can eat up to ten pounds daily. 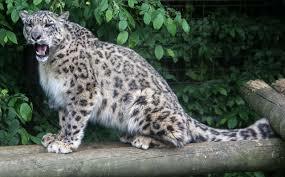 The snow leopard has also been seen eating other plants to help with digestion. Furthermore, the snow leopard has many interesting factors and is capable of many interesting feats. Snow leopards are known to be very territorial. To make sure others know that it is someone’s territory, males scratch rocks, boulders, or dirt patches. It is also known that snow leopards have been capable of many incredible feats while hunting. While trying to get prey, snow leopards have been capable of leaping twenty feet up into the air and running at 50 miles per hour. Snow leopards are amazing animals.